What happened in baseball last night was remarkable. Within five minutes we saw the Rays rally back to beat the Yankees from seven runs down. Boston’s horrific September came to its crash and burn finale as the Orioles won on a walk-off hit to deny the Red Sox into the postseason. Baseball fans were tweeting every moment as they flipped channels to watch the games. As a fan of the game you can’t help but appreciate the action from last night. Critics say a 162 game season is too long, but it came down to one last game to determine which teams would make the playoffs. The last inning and final pitch decided it all. Some individuals are already referring to it as the greatest night of the game ever. For the first time Yankee fans were content with their team blowing a seven run lead as they watched their enemy lose the chance to enter the playoffs. Tampa played hard in the month of September, making up for a nine game deficit, and ultimately winning the wild card from the Red Sox. Boston had a horrendous month and it all came down to a misplayed line drive by Carl Crawford, who did not live up to expectations this year. 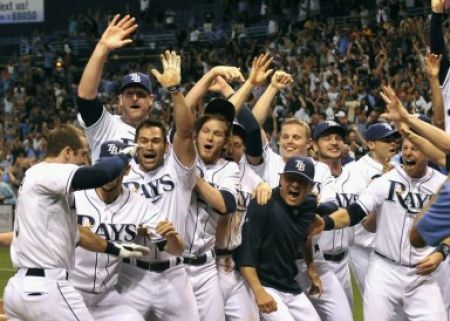 Behind the bats of Dan Johnson and Evan Longoria they powered the Rays to the playoffs as Papelbon and the Red Sox walked off the field hoping the Rays would lose. For the first time ever the Red Sox nation was cheering for the Yankees to win, something that would usually never occur in the sports world. As far as losses go, the Yankees Universe seems fine with Boston going home as they were dubbed the greatest team ever in the pre-season . In the National League we also saw another epic collapse by the Atlanta Braves who had a lock on the National League Wild Card for months. It all came down to game 162. The Braves battled the Phillies in extra innings to no avail as the Cardinals, behind a two- hit shutout performance by Chris Carpenter. Craig Kimbrel, the player who set the rookie save record this season, blew the most important save of the season as the Braves lost 4-3. The Cardinals and the Rays are what baseball is all about. How can you not cheer the accomplishments of both teams last night? It proves time and time again, it’s not over till it’s over. Two meltdowns, two fairy tale endings and now only eight teams remain in the chase for a World Series victory. Baseball fans everywhere were reminded about why this game is so great. Forget the payrolls and the media. It all came down to playing all 162 games and all 27 outs. The numbers never lie. The numbers are what people will remember as the box score is printed in the newspapers. Eight teams now fight for the chance to win the World Series.